Nike recently showcased a new shoe called Adapt BB this January. Nike claimed the shoe is designed to solve the problem of ill-fitting which many athletes, especially basketball players, have found very uncomfortable for many years. I have to say Nike is really starting this year very great. They always have new surprise for fans. This time, they surprise basketball players the most. It’s the first time in the history of basketball shoe or any sneaker to see a shoe fit being operated with an app. This is extraordinarily innovative. In many games, for example, basketball, there is usually a continuous flow of blood while the game is on. During the game, the players feet change in shape as a result of the blood flow. The expansion of the feet during this period is what makes players feel uncomfortable in their true-to-size shoe and therefore need to loosen their shoe for proper adjustment before they can continue playing. Nike has been a company that is very committed in using technology to define many of their shoes. Flywire and Flyknit are good examples. They have now reached another greater level. You may remember the HyperAdapt 1.0 that was released in 2016. It was the first self-lacing shoe in the Nike line of shoes. Despite the good ability of the HyperAdapt 1.0, it is not a shoe that is very lightweight to perform as well as needed. It is difficult to take the shoe for a half- marathon run, though it can be used for some regular gym training. You will definitely feel the heaviness anytime you put it on. In Mathematics, the concept of iteration is usually employed to get the best possible result for certain problem. The concept can also be applied in any line of shoes. It makes sense to say the iteration of the HyperAdapt 1.0 is what yielded the Nike Adapt BB. When you wear the shoe, a custom motor and gear train somehow sense the tension your foot needs. This then helps those devices to make necessary adjustment for the best fit at that moment to keep your foot comfortable. The shoe has two buttons which enable you to operate it manually. Each button has specific tasks. One for loosen the shoe and the other for tighten it. During a game, when you feel less comfortable with the fitting, that is if the fitting is too tight, all you have to do is reach out to the button and loosen it for appropriate adjustment, and vice versa. So, it depends on which fit you want. Nike claimed that you can also pair the self-lacing system with a Nike adapt app. What this means is, you can tighten or loosen the shoe with the Nike Adapt app on your smartphone. There will be specific fit settings which players will be able to input during, for example, a timeout. That is not all. What is more interesting is, with the app, players can prescribe fit settings for warm-up in the future. And, the firmware for the FitAdapt Technology can be updated. So, players can opt in for the updates as they become available. 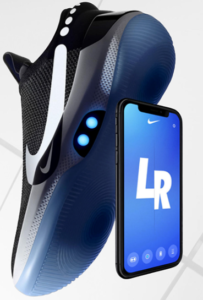 As soon as you launch the Nike adapt app, it automatically connects with your shoe. On the screen, there are two letters – L and R. L means left and R means right. You can control the fit of the shoe with these letters and also have fun doing it. The Nike Adapt BB features buttons for manual control and an app which enables control via smartphone. It has wireless charging pad. The upper is made of Flyknit and the inner is made of QuadFit mesh. Cushion foam is used for the midsole. 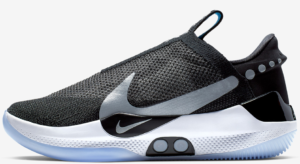 Nike put the Nike Adapt BB through different types of tests such as, end-of-life tests, impact tests, intense temperatures, waterproof tests, etc. Jayson Tatum, Boston Celtics small forward, was among the professional basketball players that was invited to Nike world Headquarter in Oregon for some tests using basketball. This new shoe is really something else. It is a shoe that is definitely going to beat the HyperAdapt 1.0 hands down when it comes to performance. This first release is for basketball players. We should be expecting Nike to release the street version in the future. An automated self adjusting shoe is what everyone needs not just atheletes. I suppose a lot of work has been put into the design and fabrication reason for the price. I certainly will like something like these Nike shoes. I’m optimistic that Nike will release the lifestyle version of the shoe. It’s just a matter of time. I’ll be sure to share this great news with my dear basketball-playing friend. Thanks for the information. Thanks for the information. A self-adjusting shoe that integrates with self-lacing is just the kind of thing busy people need. And I love that it can be controlled by your device. Never need to bend down and tie or adjust those laces ever again. This is a great innovation. Even if they don’t release the lifestyle version, this sports shoe is worth a look at. Stephen, thank you for bringing me up to speed on shoes – Nike sneakers in particular. Come February 16th, a “hot cake” will be on sale. However, it leaves me wondering, how are they cleaned? What is the price? Is there a warranty?